The disc-less Xbox One console has been officially revealed. Update: In the most recent Inside Xbox episode, Microsoft officially announced the Xbox One S All-Digital Edition. Once again, the leaks were accurate. Xbox One S All-Digital is a disc-less console that launches beginning May 7, and comes with a 1TB hard drive. The console is also bundled with three games: Sea of Thieves, Forza Horizon 3, and Minecraft. The All-Digital will run you $250, and it also comes with an Xbox Game Pass trial. 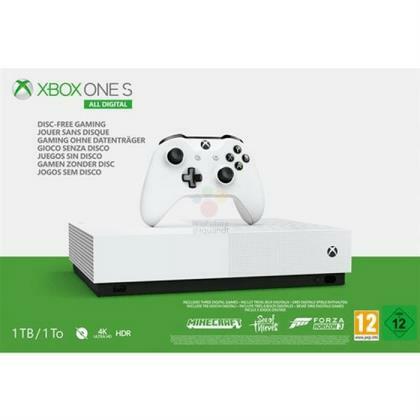 Though $250 may seem high, especially considering the price of the traditional Xbox One S model bundles at retail, it’s still $50 cheaper than Microsoft’s own SRP for the Xbox One S at $300. In the announcement, the platform holder said it expects this $50 (at least) difference to be maintained going forward. In other words, you’ll always find the disc-less model at least $50 cheaper than Xbox One S.
Read the original leak below. Original story: The Xbox One S All-Digital console, Microsoft’s first disc-less Xbox, is reportedly getting unveiled this week. German site Winfuture said that the console is already in the database at some retailers, and leaked an early image of the box and the console itself.